Have you thought about lighting up your closets, storage spaces, utility rooms or garages? Effective lighting for a small storage room or closet whether at home or work provides easy access and visibility, allowing you to be more efficient and organized. Here are five tips to help light your forgotten spaces. Whether the space is already wired is an important consideration for choosing a light fixture. If there is wiring, an electrical box or an existing fixture, then you are already in decent shape. If there is no wiring but the space is big enough that a battery powered (wireless) light is insufficient, then running wires might be essential. Various battery powered lights are available today, ranging in price from a few dollars to $40 -$50, which is the approximate cost of a motion sensor activated LED fixture that is optimal for a small storage space. But don’t forget the maintenance cost. While battery powered lights may be cheaper to buy, there is the ongoing replacement cost of the batteries to consider, plus maintenance and the typically shorter life of a battery powered fixture. The rule of lighting a smaller, infrequently used storage space is to focus on a combination of functionality and aesthetics. The amount of light required would depend on the size and layout of the space. There are free tools available online to calculate light requirements, but generally, a space that is in the range of 10 to 20 square feet would require at least one fixture providing at minimum 300 lumens, ideally more than 500 lumens. Lighting should be directed toward storage shelves and other spaces where people are likely to look and reach for. If only one fixture is used, it should be placed in a central location that illuminates most of the usable space. Depending on the layout and function of the space, multiple light fixtures may be required to direct light where needed. Electrical code guidelines are sometimes ignored, especially in a do-it-yourself (DIY) situation, but they exist for safety and to prevent fires. 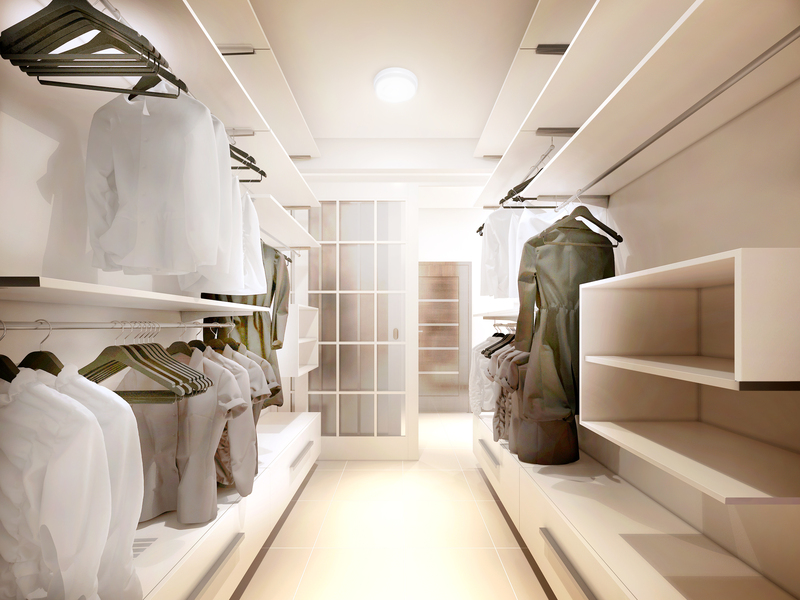 The code relating to lighting clothing closets requires that the light should be placed on a ceiling or front wall above the door of the closet, within a safe distance from shelves and moveable items. Recessed light fixtures are required to be at least 18 inches from the back and side walls of a closet.